but I managed to come up with a cute card! I’ve had this candy stamp from Imaginisce for a while, but never used it. I thought the colors would work well with it…it’s kind of Halloweeny but it doesn’t have to be. The patterned paper is from Cosmo Cricket’s Pixielicious. The rest is SU cardstock in the challenge colors. The sentiment stamp is by Savvy Stamps. 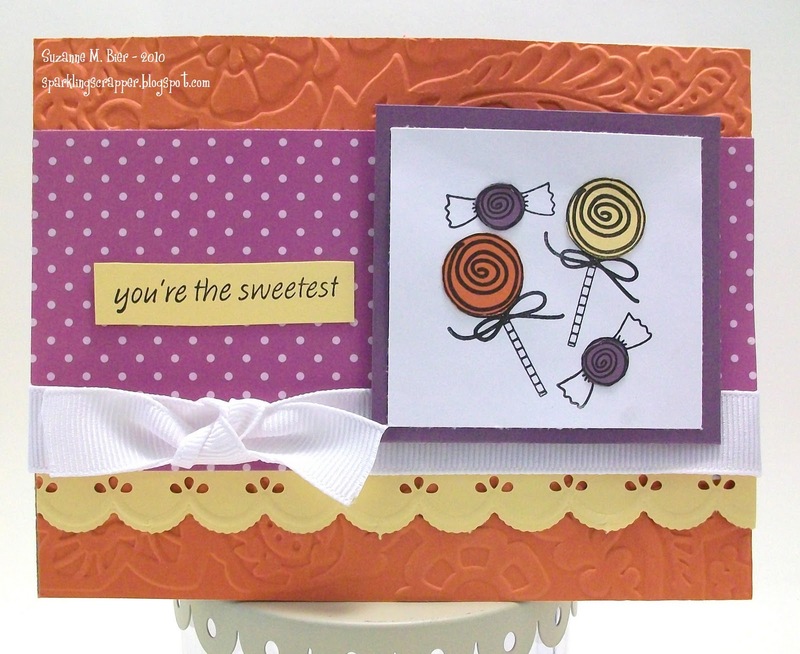 I embossed the card with a Sizzix folder and made the border strip with a Martha Stewart punch. Thanks for looking at my card! There’s lots more to see over at the Color Throwdown! Check it out! Very cute! I think a candy-themed card works great for these colors! Thanks for joining us for the Color Throwdown! This was a toughie for me too! It looks like you pulled it off splendidly! Love those candies!! Thanks so much for playing along with us at The Color Throwdown! Candy is a PERFECT way to incorporate this week's colors! Really *sweet* card!! Thanks so much for playing along!